I'm so tired from studying for midterms that I don't know what to say in this intro LOL! Something you guys probably don't know about me is that I have an issue with chronic fatigue. I get tired with little to no exertion. Even riding the bus or climbing the stairs makes me tired LOL! I have to sleep at least 10 hours a day or else I can't operate the next day (I sleep at 9:30 pm LOL!) So right now I'm basically...DEAD haha. 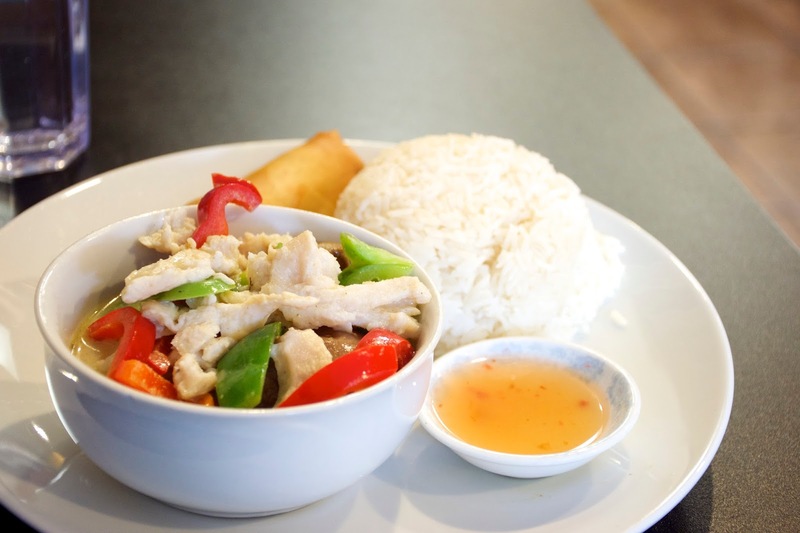 Anyways, yesterday I went to Lovely Thai on Fraser because I had this sudden craving for thai food. It's located just a few doors down from Samurai Sushi! 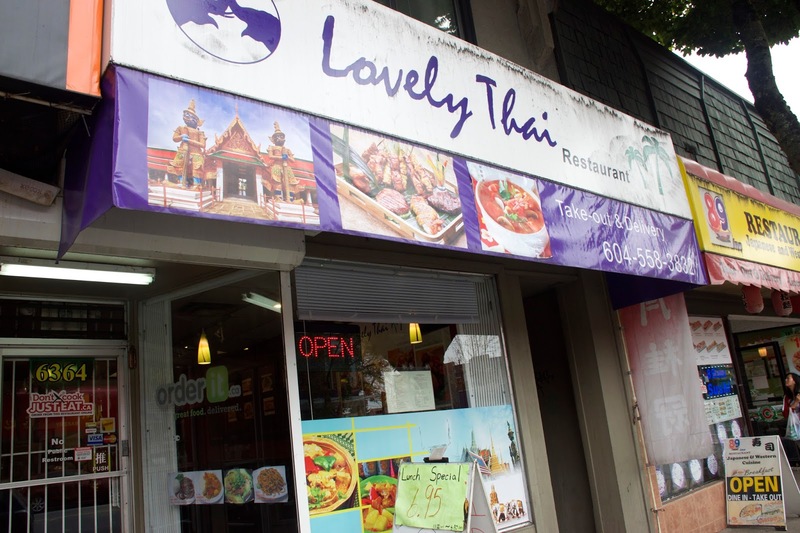 Lovely Thai specializes in homestyle thai food! You're not going to get anything fancy here, but what you are going to get is delicious home cooked food at awesome prices! They have all your staple thai dishes like green,yellow,read curries, pad thai, tom yum soup, etc. From what I observed, this place is a one man operation. After I had ordered he disappeared in the back and after 10 mins reemerged with my plate of food! He was polite, and explained the menu to me and said that if I didn't want anything spicy, he could make the food mild for me. The restaurant is fairly small, with seating for about 20. No frills, with simple wooden chairs and tables. Scenery from thailand adorns the walls. After eating you have to go up to the counter to pay! Everything here is uber affordable! Most of the lunch specials range from $7-8, with appetizers starting at $5! This place is great value for the money! 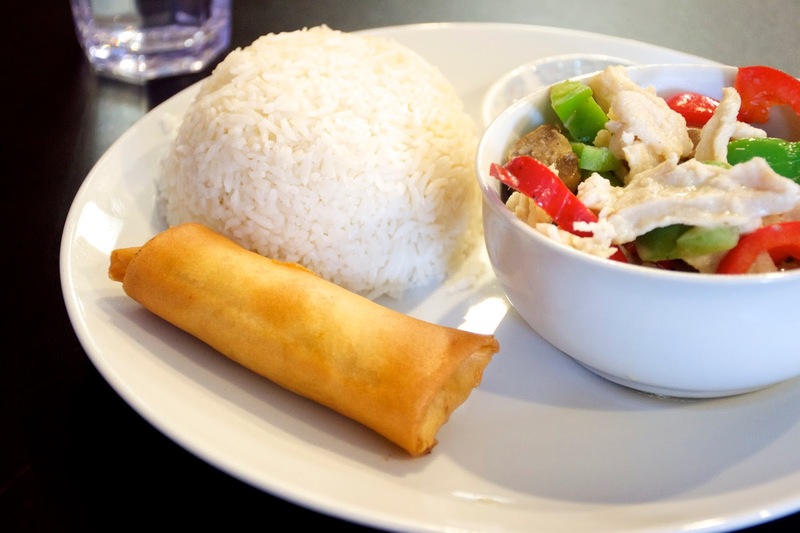 The portion sizes are large, everything is made to order, and the food is tasty & authentic! I don't know what's worse: having a badly lit photo or having to use my internal (gasp) flash LOL! I should really invest in an external flash: but that would be too bulky to carry around lol! The lighting in here wasn't that great, hence the poorly lit photos! Sorry guys! This combo was a great deal! It came with a main curry dish, rice, and a spring roll! The curry itself was really flavourful, heavy on the coconut flavour, but a bit too watery for my liking. The chicken pieces were tender though and there was plenty of veggies! The spring roll was large, with a crunchy exterior, and wasn't oily at all! It was packed with veggies and surprisingly had a ton of flavour so I didn't use the sauce on the side! The rice had been properly cooked, but unfortunately only exhibited a weak coconut flavour.